The word ‘Nootropic’ is derived from the Greek word ‘nous’, which means ‘mind’. Their story began in the 60s and 70s when research was done into compounds that could improve cognition and memory. The idea is that Nootropics stimulate neurons and increase both blood and oxygen flow to the brain, leading to improvements in your attention span and other areas of cognitive functioning. Simply put, they can be defined as ‘brain-boosters’ and ‘memory-enhancers’’; compounds that enhance elements of human cognition including mood and focus. And did you know that before reaching for any supplements, most of us consume them daily? Caffeine is one of the most common, popular and easily accessible Nootropics out there. And so is our beloved turmeric! What better excuse than to include this super root into your every day? 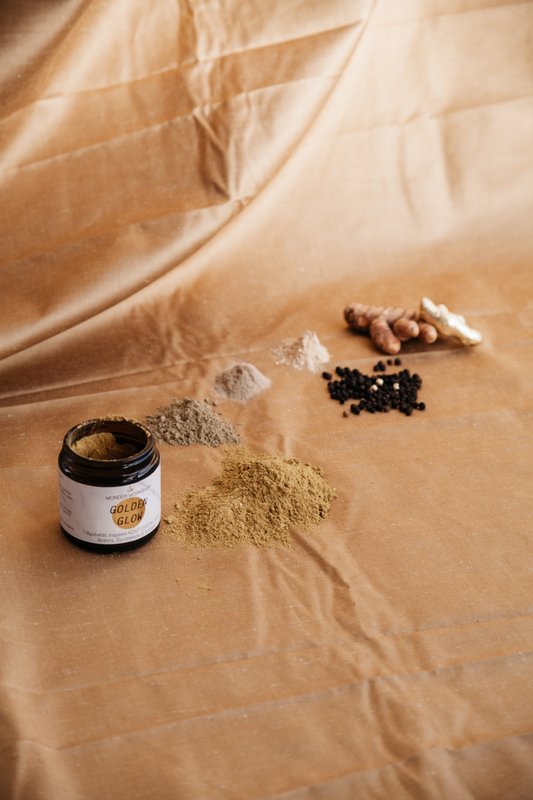 Plus, our Golden Glow adaptogenic blend combines the power of turmeric with the potent Ayurvedic nootropic Brahmi (Bacopa Monnieri), which has been known to naturally improve memory and boost cognition, helping you to feel focused and alive. The powers of Brahmi were first reputed in old Ayurvedic texts; it was given to devotees who were in need of some extra brain power to memorise long texts and improve cognition. It is the antioxidant effects of Brahmi that support increased cognitive function, alongside its ability to affect brain levels of acetylcholine, which is essential for memory. Not only this, but Brahmi is a powerhouse of an adaptogen. It has a notable ability to reduce anxiety by modulating brain levels of serotonin (the neurotransmitter responsible for our moods). Research surrounding the power of Nootropics is moving at an incredible pace as knowledge of them moves into mainstream wellness. In the meantime, head on over to our Wunder shop and stock up on your daily dose of turmeric goodness- our favourite Nootropic of them all!